Established in 1934 as model farm community. Planned as a New Deal homesteading project of ten thousand acres. Hugh MacRae (1865-1951), beginning in 1905, recruited immigrants to come to southeastern North Carolina for resettlement in six cooperatively-organized farm colonies along the railroad lines forty miles north and west of his business operations in Wilmington. MacRae, upon graduation from the Massachusetts Institute of Technology, began his career as a mining engineer. In 1889 he created the resort at Linville, North Carolina, and introduced Grandfather Mountain as the tourist attraction. In 1895 he moved to Wilmington to head a cotton mill operation; five years later he became president of Wilmington Gas Light Company. MacRae is also credited with developing Wrightsville Beach as a summer resort. • CASTLE HAYNE – The most successful of MacRae’s experiments, the site selected in New Hanover and Pender Counties was once a colonial plantation belonging to Roger Haynes. The settlers were principally Dutch. Their main industry was flower-growing, including the cultivation of daffodils, irises, and gladioli. 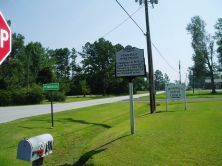 At one time Castle Hayne is said to have had one of the highest per capita incomes of any rural community in the South. • MARATHON – Benefited from proximity to Castle Hayne; in time lost its identity and became part of the latter. Settled initially by Greeks. • NEW BERLIN – Among the more ambitious of MacRae’s plans, it was nevertheless unsuccessful. Using German and Hungarian settlers, MacRae plotted 193 farms and twenty-three town blocks. Remnants of the colony survive as the community of Delco in Columbus County. • VAN EEDEN – Settled by Dutch newcomers in Pender County, the colony suffered from drainage problems. Later home to Jewish refugees from Nazi Germany. All evidence of the community was gone by 1946. • ARTESIA – A Polish community between Lake Waccamaw and Whiteville in Columbus County, the colony was not successful. MacRae’s experience with the farm colonies stood him in good stead almost thirty years later when he sought to develop Penderlea Homesteads. Despite his best efforts, however, the community’s operation, during the era of New Deal idealism, was taken out of his hands and federalized. Owing to its later origins and distinctive history, Penderlea has a history separate and apart from the earlier farm colonies. It was MacRae’s idea, during the depths of the Depression, to create on a grand scale a model farm community at Penderlea. 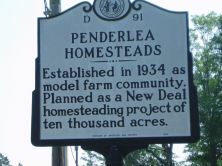 As manager of the Penderlea Homesteads, he was assisted by a board of directors from State College, Princeton, and Harvard. Their intention was to build, with government assistance, the “best planned rural community in the world.” A tract of 10,000 acres was set aside, land cleared, homes and a community center built. The New Dealers had in place other similar programs but this was the only one of such size in a rural area and, in the end, their most expensive. MacRae differed with Interior Secretary Harold Ickes over how Penderlea should be managed, and, on May 12, 1934, the entire program was federalized. MacRae appealed to the President but to no avail and a few months later resigned as manager. First Lady Eleanor Roosevelt visited the project on June 11, 1937. Control passed from the Division of Subsistence Homesteads to the Resettlement Administration to the Farm Security Administration, each with a new set of policies and requirements. The original goal of 500 twenty-acre farms was never met. A total of 142 units were leased but, by the onset of World War II, few of the original homesteaders remained. Liquidation followed and by 1947 all farms had been sold, most to their tenants at low interest. Today many homes, the large community building, and other structures associated with the project remain.